I've started preparing almost all of our foods from scratch in the kitchen because it's healthier and more economical. However, it can be very time consuming. When I first started (which was recently) I found myself very overwhelmed. Even a simple meal like burgers and fries becomes time consuming when you have to make your own hamburger patties, bake your own hamburger buns (yes, I do this!) and cut and bake your own fries. But I've learned a few basic tricks that make things easier. It may seem like my suggestions are simple, but in truth I've found that it's the small adjustments that make the biggest difference over time. This meal actually started the night before. I took a bag of Great Northern beans that I'd found on clearance and put them in water overnight. I grabbed a chopped green pepper from the freezer (it was left from our garden last summer - I chopped them all up into 1 cup servings and froze them), grabbed a tupperware of chopped onion in the fridge that I'd prepped earlier this week, and added 4 1/2 cups water, some chopped turkey bacon, molasses, brown sugar, and garlic. I placed this is my slow cooker and tucked it in the fridge. It took about 5 minutes total to prep this recipe. The next morning all I needed to do was strain the water from the beans, and toss them in the slow cooker for the day. Later in the afternoon, as the scent of baked beans wafted through the air, I made some cornbread. Baking will go much faster if you first gather all of the ingredients together. That way you aren't walking back and forth to the pantry - you have everything at hand. I like to get creative with my cornbread, so I tossed in some green chilis, some corn, some cheddar cheese and sour cream. Readers, what are your secret kitchen timesavers? I need to start doing this! The meal looks great! Cooking from scratch is so much healthier in addition to being cheaper. Love you recipe. I am going to try it with lima beans and also with lentils. Both are excellent in baked bean recipes. I have never tried a recipe of yours that we didn't like. Thanks for posting this. The only Electrolux product I have is my vacuum cleaner, but it is from 1977 and still going strong. Their stuff is really made to last! I envy your even making your buns. I like to make breads. Hey, I just visited your Electrolux link and entered to win one of those induction cooktops. That thing looks wonderful!. Only bad thing about winning would be that it would mean I would want to do the whole kitchen over...granite countertops, new sink, the works! How could I put a great new appliance like that in my old kitchen? Thanks for the link! My crockpot is my favorite appliance. Since our current job is a short one and we are living in a hotel room, it is indespensible!! That looks delicious. How true it is that gathering all your ingredients makes it all go so much faster, plus you don't realize half way through that you are missing something! The one thing I always try to do when making something from scratch? Making sure I have all my ingredients measured and ready to go. And making sure I read through the recipe first (if I've never used that particular recipe before) so I know if there's part of an ingredient (or two or three) that I need to reserve, or if there's going to be some "surprise" step I hadn't originally anticipated. Sometimes I get as much of the recipe accomplished ahead of time (like chopping/dicing/reserving veggies/other ingredients) when I have a chance (like you do, when you chop an extra onion, etc. ), so that when meal-prep-time rolls around, some of the steps are already done. We are mainly a veggie family, so I cook A LOT of beans. I cook them from scratch because it is relatively easy, just time consuming - like you said. At the beginning of the week I usually cook all of our beans for the week, some go into the freezer, some go into salads that will stay in the fridge for a couple days, some go into bean dips for veggies or wraps. It ends up taking me most of the day to cook all the beans and then get them in bags in the freezer, or whatever else I am doing with them, but then the rest of the week it is relatively easy to grab something from the freezer and make a meal in the crockpot or whatever. Wonderful tips you have shared and the beans look so hearty with the cornbread. Wishing you a nice weekend. Wish I had one of these induction tops.Your energy is unbounded, probably because you are a runner and are in such good shape. I bet by now there is not a trick in the book that you don't know! I love cooking from scratch, and this post was really inspiring. My grandma was really good at doing what you've described here-and like you said, the little adjustments can make the biggest differences. I've started doing very similar things. To me, it pays off so much in the end it's worth it! Speaking of all of that chopping...my new favorite kitchen tool is the Vidalia Onion Chopper! Worth every penny. Perfect dicing in 1/4 of the time! A great recipe. I need to do more pre-preparing of things! I always enjoy their commercials and that fast boiling water feature! I hate waiting for water to boil. Love your ideas. As long as your already chopping may as well do more and freeze them! Your dinner sounds tasty. 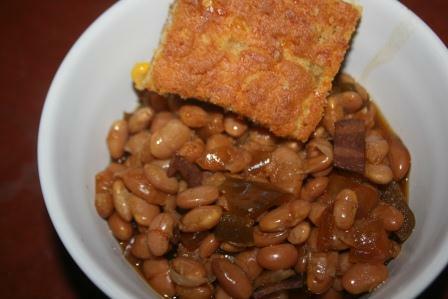 Beans and cornbread... humble but oh so good! Your very organized. I think we need to start freezing some cut up onions too. Your dinner sounded so good. Great tips. Being prepared and organized is one of my pet peeves, but I still forget things we've put in the freezer for later use. I need to work on that more. I am so impressed! And the meal looks delicious. The cornbread sounded yummy. My husband likes to make cornbread, but he doesn't make it from scratch. I like the idea of adding sour cream. I hope you and yours got through last night's storm OK. It was a whopper! Great tips Lisa!! My best time saver is to let my Hubs do the grilling. I bet those beans did have an excellent aroma. And you rock with hamburger buns from scratch! This sounds really good! And I so appreciate the tips for preparation ahead of time. I wish I was more of a planner. Maybe it's something I could learn to do with baby steps. Thanks for sharing! Enjoyed your post, and we cook like that too, for the most part. Oven fries are good. You talked about cornbread, and I wish I had a recipe to make it that is more like corn-cake bread! The recipes I have are more dry and crumbly - I like the moistness of some I have tried at restaurants. Guess I'll have to so some searching! I got cornbread on my mind, now, thanks to you! MMmmm looks delicious i love to cook and I agree always make more and freeze. Love the header pictures of your ranch looks absolutely beautiful. What are Northern Beans? ?